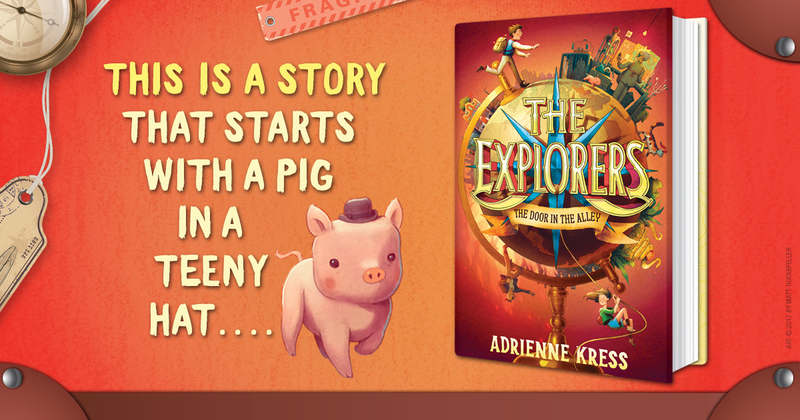 "The Explorers: The Door in the Alley" is the first book in a series that is sure to hit young readers right in the funny bone." With school winding down things at school have been really crazy. So I haven't managed to finish this book yet. But the part I have read is definitely amusing and strange. 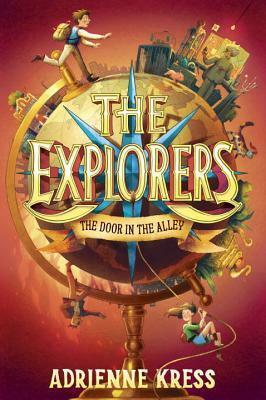 Sebastian stumbles upon the door in an alley near his home with a sign about the Explorer's Society, but he doesn't feel like it is something it is appropriate for him to be interested in as a logical thinking person. But when he crosses paths with a pig-in-a-teeny-hat he gets drawn into the society despite himself. That's as far as I've gotten but I have a feeling that whatever is coming next is bound to be surprising. Well, the book definitely took off in a rather unexpected direction. I really had to suspend disbelief to make it through the rest of the book. When Sebastian is told by members of the Explorer's Society to 'break' a rule, he can't believe it. But while he's cleaning the archives room, he stumbles across a hidden door behind which he finds a rather plain, ordinary wooden box. But after taking it home and figuring out how to open it, he discovers information about the Filipendulous Five, including the leader Alstair Drake. While Sebastian is puzzling over this group that has never been mentioned during his time at the Explorer's Society, the other main character Evie is having her life shaken up, literally. Evie is an orphan, living at a state-sponsored boarding school that she hates. Each week she goes to have dinner with an older couple, the Andersons. Unfortunately, the Andersons seem like the most boring couple on the planet, that is until one dinner party is joined by two thugs armed with guns and daggers, one of whom has a badly burned face. What they are after, Evie has no idea, but it's clear they are after something. Evie manages to escape with a letter Mrs. Anderson gives her and makes her way to the Explorer's Society where she teams up with Sebastian. From here the story leaps into full gear as Evie and Sebastian look for members of the Filipendulous Five in order to seek help finding and saving Evie's grandfather. But the thugs are still on the loose and more than ready to complicate everything even if it means invading the Explorer's Society. Once I let go of the more absurd parts of the story, I actually enjoyed it quite a bit. This is a great book for those who enjoy a mad-cap ride with a strong dose of the absurd. 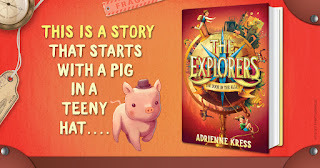 I've always been intrigued by the pig with a teeny hat, have to check the library for this.